Would You Like Fries with Your Human Interest? McDonalds To Add its Own Channel!!! 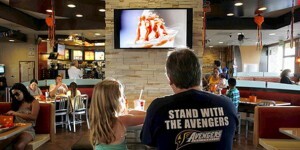 McDonald’s is stepping up its game with McTV, a high-definition in-restaurant channel that will play while you eat. McTV will feature local school sports, movie previews, and human interest stories. Every restaurant’s channel will be localized to appeal to the customers within that particular location. ChannelPort Communications LLC is spearheading the project, and they’re pulling out all the stops. Moguls like BBC America are offering content for the new channel, already available in about 800 stores around California. The channel is expected to reach 18-20 million customers every month – especially since the TVs are going even while you’re in line. That would be one of the largest daytime television audiences ever. There will even be interactive Web and mobile platforms added if the project succeeds. Dining areas will be fitted with two 42-46 inch screens, with audio coming from speakers in the ceiling. There will be small “quiet zones” for those who do not wish to see or hear the channel while they eat. Programming will be shown in a one-hour cycle, with components split into “pods.” Each “pod” will have highlights like “Mighty Moms,” which details local moms who deal with both a stressful job and raising kids. About eight minutes of each hour will go to advertisements, with only 90 seconds dedicated to McDonald’s itself. Some of the “pods”, however, might include segments about the food industry or Ronald McDonald House. McDonald’s hopes that the channel will have people coming into the restaurant as opposed to just driving through. They say that their intent is to keep families together, chatting and enjoying their time in the restaurant. I don’t see that working out, but I guess it’s not any worse than a sports bar. Just one more way for us as consumers to pay more attention to a screen than to each other when we’re out and about. If there’s a screen, we’re more likely to look at it than at our companions; it’s just how our brains work. There’s also the icky idea that if restaurants keep adding things like TVs, we’ll never escape the continuous onslaught of media and advertising. Never. This entry was posted on Tuesday, October 18th, 2011 at 3:57 pm	and is filed under News. You can follow any responses to this entry through the RSS 2.0 feed. You can skip to the end and leave a response. Pinging is currently not allowed. « HBO to Bring New Drama ‘China Doll’ to Series from Creators of ‘Big Love’!! !